In these warm months of longer days, we can feel more generous with time. Watering the garden takes time; steeping sun tea takes time. Is there more time to think right now? I’d like to think so. “In the fulness of time” is a phrase that has such a tempting feel to it – in the fulness of time, I could write a book; knit a sweater; learn to meditate… so many delicious things can happen with the gift of time. Today’s Inspiration Monday is a lightweight, fun, colorful project that would be an ideal companion to a summer’s day … and it’s quite literally Timely. 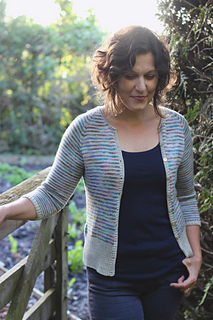 This stripey, top-down cardigan by Libby Johnson of Truly Myrtle is a treat of a project, combining stripes and easy construction – it would be timely to start it now so you can wear it as the evenings draw in this Fall. Doubly timely, as well, given that Libby started a KAL over in her Ravelry group on July 1. Choose some colors lickety-split, get your order in, and the Barn Girls will have your yarn to you asap so you can swatch and join in the fun! But what yarn? This little cardi is going to be a three-season stunner because of its gauge: 27 sts and 39 rows = 4″/10cm is a super-lightweight fabric that can go outdoors in warmer weather, or be the perfect layer for the office A/C. For my project (and you know I already got my order in), I chose to stay true to her beautiful photographed sample and use a pale neutral for my Color A – I chose Jengu, one of the Spirits. Because these pale, pale neutrals are ‘spirited from’ just one color, you can tease out your favorite hue from a multicolor and anchor it with your favorite Spirit. For Color B, you can really let fly – even if you’re resistant to wearing multiple colors at once, like I am. The alternating stripes of solid + multi create a harmonious, and nearly minimal, impression. So here was my chance to dip my toe into Buffy waters – I chose Xander, because I’m totally infatuated with browns and blues together right now. Since Jengu is spirited from blue, I know they’ll go together beautifully. I’ll list the Bespeckled colorway and then next to it will be a list of shaded solids that I like with that Speckle. DepravedDyer Birthday Sprinkles : Just about anything. On the brighter end Boysenberry, Aquarius, Fancypants Fuchsia, Lean Mean Aubergine, Tit4Tat. On the lighter end ~ Chillaxin, Rosebud, Everyday Grey, Pistachio, KMBFLA and Lauma. Autumn’s Up: Magically Delicious, DesAqua, Pistachio, Saffron Surprise, Coral, Melusine, Pond Scum, Aquarius, Chillaxin, Calendula, Harriet and Sun Salutations. Guardians of the Galaxy : Just about anything!! I like Everyday Grey, Mermaid Tears. Jengu, Tit4TaT, Smoke on the Water and Pistachio to name a few. And since it’s Inspiration Monday, we’ll leave you with this inspiring quote. This week’s is from Virginia Woolf, and we think it speaks directly to us as knitters, especially knitters who love garments.